Yong speaking at the press conference. KUCHING: The Pakatan Harapan (PH) federal government has agreed to build a house for Tchee Fah Hin whose son Kiam Jong was among the three killed in the explosion that struck CityONE Megamall here on Dec 4. This was announced by Pending assemblywoman Violet Yong at a press conference at the Democratic Action Party’s (DAP) headquarters here today. “The house will be built after the Sarawak government alienates a piece of land which I understand is an empty plot near his current place,” she said. Yong pledged that the PH government, through Syarikat Perumahan Negara Berhad (SPNB), will build the house for Fah Hin once the Sarawak government completes all the necessary procedures. According to her, the house will be the Rumah Mesra Rakyat (RMR) type with three bedrooms, two bathrooms, a kitchen and a living area. 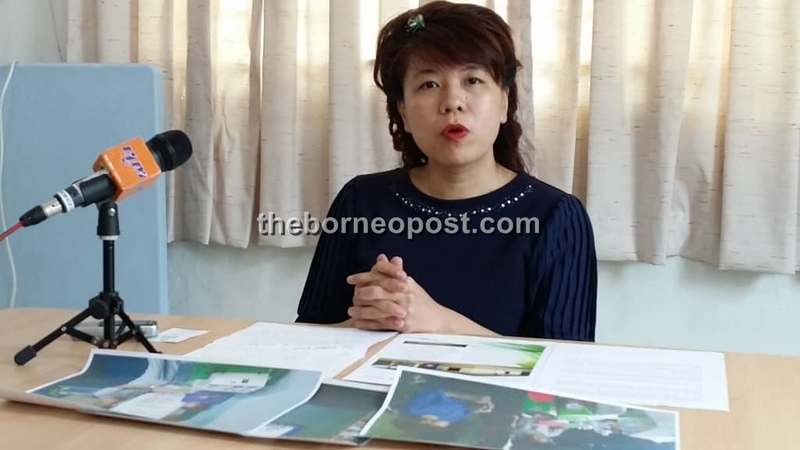 She said it is essential for the Sarawak government and the state Land and Survey Department (LSD) to see to it that Fah Hin owns the land before the PH government and SPNB could construct the house for the 66-year-old. Yong said she met Fah Hin on Thursday to convey the good news to him. On that same day, she said she also met SPNB Sarawak relations officer Wan Habeeb Alli Wan Yep Mohdzar, who briefed her on the details. She therefore urged the Sarawak government to expedite the process and finalise the alienation of land. “This is so that we can fulfill the wish and dream of Mr Tchee (Fah Hin),” she added. Last Sunday, Fah Hin expressed his wish to have a house of his own when Gabungan Parti Sarawak (GPS) youth leaders visited him at his house in the Stampin Resettlement Area. At present, he is living in a shabby wooden house where the land does not belong to him. Fah Hin had hoped that the Sarawak government could help him by giving him a piece of land in the Stampin Resettlement Area.